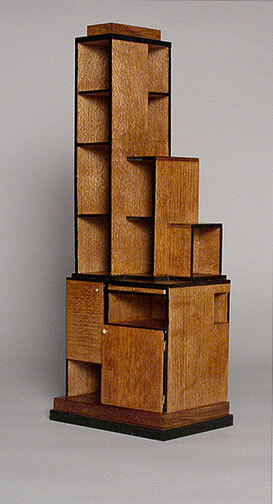 The Frankl Tower is a classic example of his skyscraper furniture. Blond woods. Chrome. Atomic designs. The living room of tomorrow first took shape in the 1950s right? Actually modern furniture’s roots started much earlier as part of the Modernism movement, a cultural movement started at the end of the 19th century. In contrast to Victorian times, when furniture was prized for its ornateness and valued for the time it took to build, the modernist philosophy said furniture should have a function. The advent of mass production made furniture making more affordable and allowed designers to experiment with new shapes and materials. Many of the elements we consider modern – flat, abstract shapes, geometric forms and modern materials such as steel, Plexiglas and canvas were first present in the American design work of the later 1920s and 1930s and included some of the furniture of Paul Frankl, Donald Deskey, and Gilbert Rohde. These changes signal not just a shift in philosophy, but accessibility as furniture for the first time became promoted for its flexibility, functionality, and suitability for apartments and small homes. Then as now, modern pieces served multiple purposes by being both practical and portable, and designers prided themselves on knowing how to pack the most into a piece. Today modern furniture’s ability to blend with other styles, from the chic Art Deco to the sleek lines of Scandinavian furniture to the yen like simplicity of Japanese design ensure that the pieces you buy today will continue to serve you well into the future. I usually don’t post in blogs but your blog forced me to, amazing work.. beautiful ! Cartucce How can I subscribe to RSS?